After several days of overcast skies the sun finally broke through the clouds just as we were headed toward Ballinskelligs Priory. 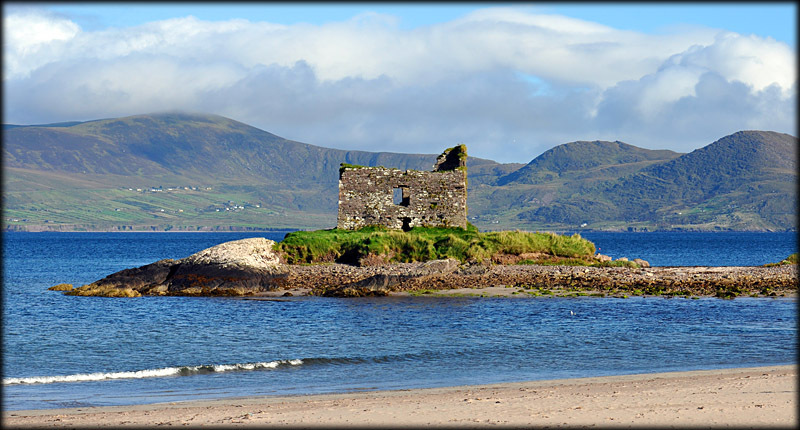 What a great thrill it was to stumble upon this beautifully situated castle ruin on the tip of a narrow promontory just off the western shore of Ballinskelligs Bay. 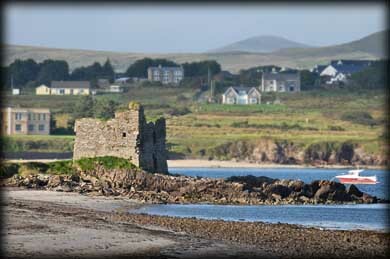 This tower house is one of many such houses built in the early 16th century all around the Cork and Kerry coasts by McCarthy Mór, Chieftain of Munster, in order to protect the coast from pirates and to charge a tariff on incoming trade ships. Corbelling indicates this castle was once three stories tall, and the walls averaged 2m in thickness. The doorway faced the sea with an intra-mural chamber and a murder hole just inside. The castle once stood on over 2 acres, but now only this small bit of promontory has avoided erosion into the sea. Excavations were undertaken at the castle in 1988 after several severe storms revealed some archaeological features on the seaward side. 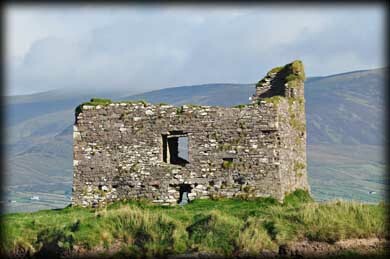 When Christopher Sigerson obtained the nearby Ballinskelligs Abbey in 1620 he and his family resided in this castle. Little more about this castle's history could be found, but it must have been a delight to live in this marvelous beach house. Situated: Very Easy. 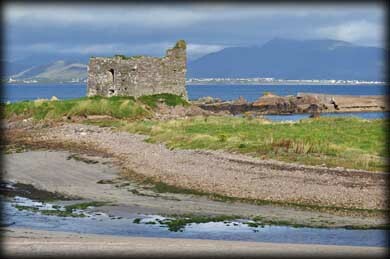 located on a small spit of land at Ballinskelligs Beach. Discovery Map 83: V 4348 6550. Last visit Sept 2012.